Sealed or Ported Subwoofer Enclosures - Which is Right for You? Sealed or ported subwoofer enclosures… this debate will never be settled because the answer is subjective. The type of music you listen to, the specifications of the subwoofer(s) you choose, the available space to install your subwoofer enclosure, and other contributing factors all play a role in determining whether a sealed or ported (vented) subwoofer enclosure is better. The real answer to this long debated question varies depending on factors like these in each application. We already know that the only way you're going to get full, rich bass from your car stereo system is to add a subwoofer. The addition of a subwoofer to your system will greatly improve the fun and impact of your music, no matter what kind of music you listen to. When considering what style of enclosure to buy or build for your subwoofers, you have to answer some questions that will lead you to the right answer for your specific listening preferences and vehicle. If you like your music “boomy”, vibrating your car’s body panels, you want to consider a ported (vented) enclosure. These types of enclosures, when built with the properly calculated volume and tuned to the correct frequency for the subwoofer, are generally louder than a sealed enclosure. In a vented enclosure the woofer and port work together with the port resonating like a pipe organ. This works with the woofer to generate more bass than a sealed box. Ported enclosures are generally larger in overall size, so some installations may not have enough available space for a ported enclosure built to the proper specifications. Tuning of the port is critical to maximizing the output capability of the subwoofer. They allow subwoofers to reproduce the lower frequencies found most often in Rap and Hip Hop music. Tuning the port is a science and is done through calculations including the size and length of the port among other things. But if a port is not tuned correctly, it can limit the performance of your subwoofer(s) and/or have a damaging effect that may eventually cause your sub to fail. 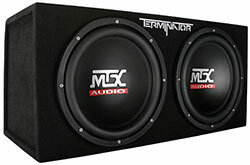 MTX Audio subwoofers are designed with built-in protection to reduce the possibility of failure if installed in a vented enclosure that is not tuned properly, but improper tuning will still cause unnecessary stress, and will hinder performance. Ports/Vents can be round, square, triangular, rectangular or any custom shape you can think of. For example, the port of the enclosure shown above is a rectangular slot port in the front of the enclosure. The port/vent shown below is triangular in shape and is also a slot port design but is located on the side of the enclosure. You typically find ported enclosures in vehicles that compete in SPL (Sound Pressure Level) competitions which measure how loud a vehicle’s sound system is in decibels or dB’s. Ported enclosures are generally more efficient in regard to the amplifier power necessary to make the subwoofers perform and allow you to use a smaller amplifier than you would need with a comparable sealed enclosure. Another advantage of choosing a ported enclosure is that the air flowing in and out of the port help to keep the subwoofer cooler. Subwoofers in a ported enclosure are a bit more reliable and will last longer than they would in a sealed box simply because they run cooler. Some people prefer sound quality over SPL, or “tight”, more accurate bass over rattling the mirrors off their car. Sealed enclosures aren’t typically as loud as ported enclosures but they still enhance the listening experience greatly by providing more defined low frequency passages such as kick drums. The bass can still be felt in your chest and in the seats of the vehicle as if you were front row at a concert. Sealed enclosures reproduce the low frequencies more accurately than ported enclosures because the air inside the box acts like a shock absorber, allowing the subwoofer to move back and forth in more control. The sound waves are reproduced more accurately than with a ported enclosure but the subwoofers may require slightly more power from the amplifier to get the woofers to move as much as they would in a ported enclosure. Sealed enclosures are generally smaller and easier to build because there is no port to tune. You simply build the enclosure to the proper specification for your chosen subwoofer(s). So whether you listen to rap, country, metal, or classical, your sound system can be improved with the addition of a subwoofer. How much space you have available, or are willing to give up, to install a subwoofer can be the deciding factor as to whether you choose a ported or sealed enclosure. But with either choice, build the enclosure to the appropriate specification given by the subwoofer manufacturer. The best subwoofer on the market can and will perform like a $10 flea market model if the enclosure isn’t built properly. When researching enclosures and subwoofers, below are some of the more important specifications and terms you will need to know in order to make the right decision as to whether a subwoofer and enclosure combination is appropriate for each other. Driver Displacement – Driver displacement is the volume of space displaced inside the enclosure after the subwoofer(s) has been installed. The enclosure volume before the subwoofers are installed minus the driver displacement of each subwoofer will give you a final volume for your enclosure which should be as close to manufacturer spec as possible. Frequency Response – the frequency range that a subwoofer can reproduce under normal circumstances denoted in Hertz (Hz). 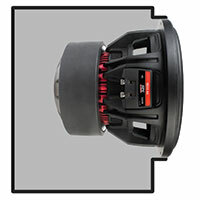 Recommended Enclosure Volume – The amount of volume inside the subwoofer enclosure that the manufacturer of a subwoofer recommends (after the subwoofers have been installed) in order for the subwoofer(s) to perform to their maximum potential. 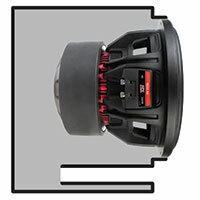 Subwoofer Mounting Depth – the amount of depth from the bottom of the mounting flange to the back of the subwoofer. You must ensure that your enclosure depth is slightly greater than the mounting depth of your subwoofer in order to make sure there can be a good seal between the mounting flange and the enclosure. Bottom & Top Depth – If you find this spec, you are probably looking at a wedge style enclosure. Not all enclosures are a perfect square or rectangle. Some enclosures are wider at the bottom than they are at the top creating an angle that is usually meant to match closely to the angle of a rear seat so the enclosure fits nicely up against the back of the seat inside a trunk. 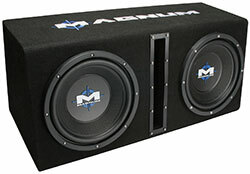 Click here to shop for subwoofer enclosure packages.